Has anyone heard of this new tat ink coming out? It's easier to remove with lasers if the bearer happens to change their mind down the road. One artist being interviewed on the news I saw has questions to the inks lastability if the tat owner does want the image forever. 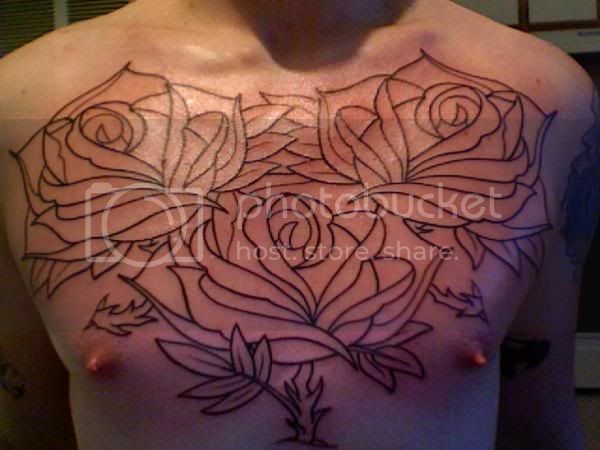 If the coloring fades, or even the outline, which they all eventually do to some extent, you can can get it touched up. True and it is generally pretty cheap. Sometimes even free. As this is in the Creative section and is about the wonderful world of tattoo's, I was wondering if anyone knows where to get a character drawn up? U guys have great work and I wanted to know if you drew it up yourself or u had your artist do it? As my drawing skills reached their peak with stick figures it is hard to put my idea into reality! I had a great artist in Australia which did my leg, but I cant get in contact with him. Any help would be great! And it is so rad to see so many great tatts and people that are proud of who they are and what they love!!! Thought I'd jump in with my latest ink! Goin full color in a couple o' weeks! I love all the tats!! That tat's looking fantastic. Welcome to the site. I can't wait to see in color! and some non fett ones. So hey guys. The new guy joins to show of his new tat. Taken with my crappy built in webcam, but I bet you get what it is. Not that painful as I tough it would be. 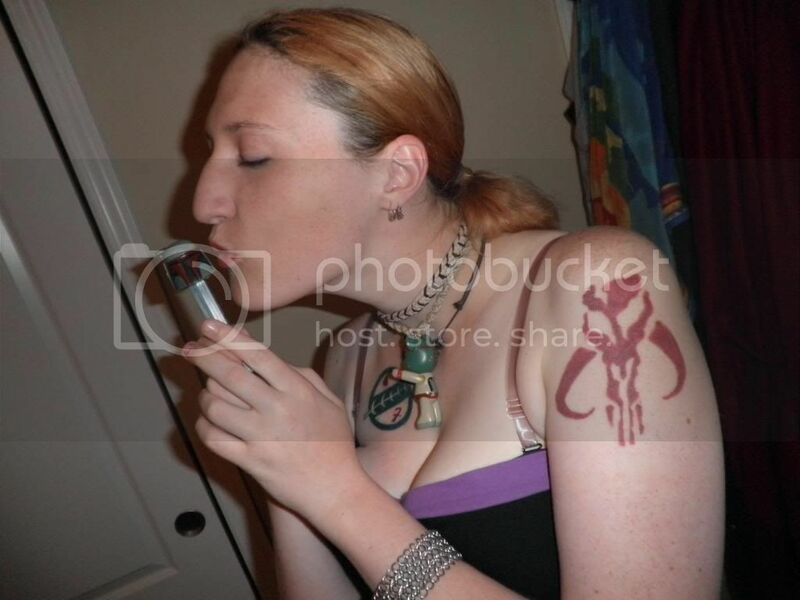 Here's my one, a few years old now, but the edited warhammer tattoo was done the same day as the photo. Great tats, all, apparently I had never seen this thread. Now this is real devotion. Particularly love your Boba tat, Chaplain. The Death Star behind him adds something awesome. Sweet tattoos. The last tattoo I got hurt, so no more for me. What did you get done? I'd love to see it. I've made a few drawings for a tattoist once. Dragons and skulls, mostly. I guess I could get one of my drawings tattoed, someday. I used to be a huge KISS fan and for a long time I wanted their four heads with their autographs all over my back. Damn, so glad I didn't get that, lol. I'm not really a fan of Paul and Gene anymore now. Sorry it took me so long to get a pic. Tattoos on my ankle so I couldn't get a good pic myself, had to have my husband take it. oh how i wish i had a tattoo, just not sure of what to get. everyone's tats here are all so very cool and such (even the non-fett ones). 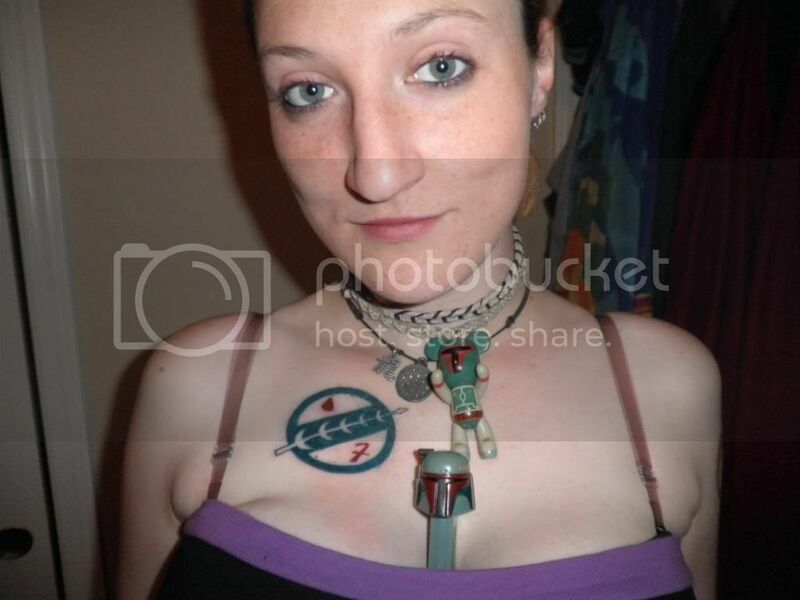 Hey...I've been debating on which tattoo I should get to honor Boba Fett. 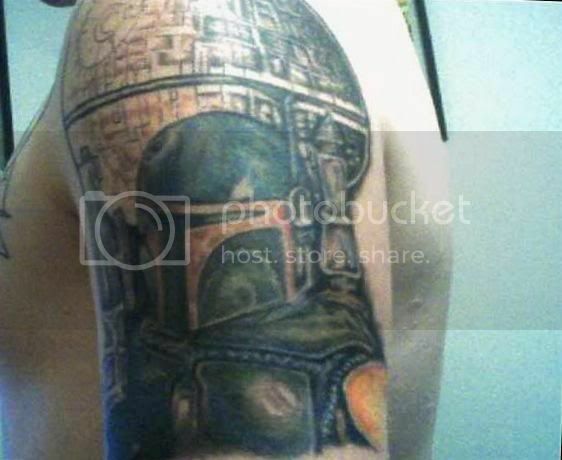 Should it be the Mandalorian Icon that can be seen on Boba Fetts shoulder...or the one on his chest?